At the northern edge of the beautiful Scottish Borders market town of Kelso lies Kelso Golf Club, where locals have taken to the fairways since Ben Sayers designed the original nine-hole course in 1913. 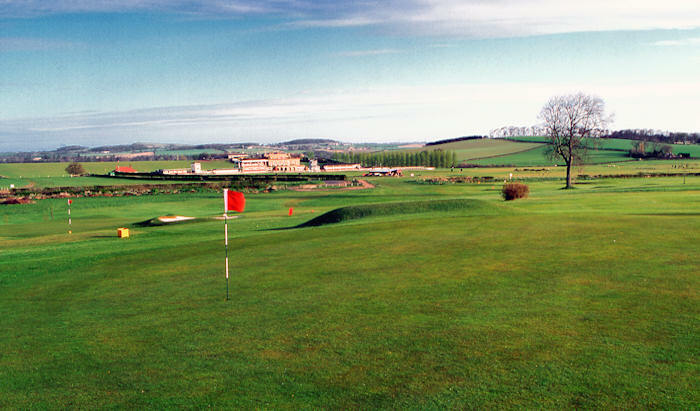 Set partially within Kelso Racecourse, the course – extended to 18 holes in 1980 – is generally flat, allowing for easy walking, while the course is well-known locally for the quality of its turf and greens, the latter of which are considered among the best in the Borders. The 'Stank', an open ditch now thankfully paved, is a feature on many of the holes in the middle part of the course. As well as an excellent course, Kelso also offers a welcoming and comfortable clubhouse and dining area with views over the layout. Clubhouse staff, meanwhile, will ensure that a warm welcome and good service awaits you, with a wide range of drinks available to suit all tastes. That’s easy….the 15th a lovely par 3 to an elevated green is considered to be the finest short hole in the whole of the borders. Book and play your golf within 7 days of booking and you can play this course for free. Book and play more than 7 days in advance and you must also book one of the mandatory packages below. Spend £10 in the Clubhouse (snacks, drinks, golf balls etc) on the day of play. 2 course menu options and pre-play bacon rolls with coffee are available for groups of 10 or more @ £13.00 per head.